The Beach is not a great film. Leonardo DiCaprio’s first film after Titanic, it was a commercial success but a critical flop, with a 20% rating on Rotten Tomatoes for its “unfocused and muddled” story. If you’re a long-time reader, you’ll know I love seeing ’90s internet captured in film and television. There aren’t many examples of real ’90s user interfaces in motion, mostly limited to VHS tutorial videos, some of which I’ve digitized here in the past. In most movies of the era, filmmakers typically made fake GUIs that bore little resemblance to reality. But Danny Boyle decided to buck that trend, using real hardware and software available in 1999, including a short capture of the 1990s web. I couldn’t find good quality copies of these clips online, so I made them myself. 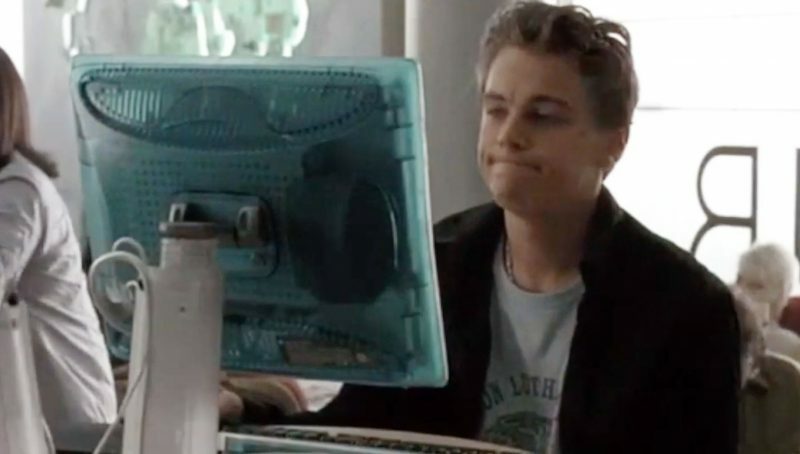 At the end of the film, Leonardo DiCaprio’s character goes into a fictional New York cybercafe called 01001HUB, packed full of vintage Apple technology—a sea of iMac G3s of every color and their horrible hockey puck mice. Leo sits down to an Apple Studio Display in blueberry, checks his mail with Internet Explorer 4.5, and we get a nice split-second glimpse of the 1999-era Excite homepage, before he signs into Excite Mail with its whopping 3MB quota limit. Earlier in the film, DiCaprio plays Rampage World Tour, released for the Game Boy Color in 1998, on an original monochrome Game Boy. Finally, in a sequence that veers stylistically from the rest of the film, DiCaprio’s character hallucinates himself as the main character of a game inspired by Banjo-Kazooie, released the previous year for the Nintendo 64. How did this never become a meme? Seriously.